Sweet golden lava thrust upwards by a rushing gust of ozone. Honey unnaturally poured into rock-crystal honeycombs. To me: the smell of Berlin. Linking a fragrance to experiences within a time-space frame (say, a trip to Berlin). A form of olfactory geomancy we unconsciously perform every time we choose a scent for a special circumstance, a specific place. Assigning a meaning to its notes not necessarily intended by its author. What better note to wander in an unknown city on Easter weekend with a perfumer whose given name is that of the saint who bore Christ across a river – the patron saint of travelers --, and whose surname literally dips into honey – “miel”, in French? Throughout our walks, Christophe Laudamiel kept repeating how much he recognized himself in the fragrance. When I first smelled Nouveau Né, I said it felt like honey pushed upwards by an ozonic base: like the toad-in-the-grass, the composition gave off an arrestingly spatial impression. Christophe Laudamiel then showed me the moodboard supplied by Sebastian Fischenich of Humiecki & Graef, the brand that commissioned the composition: honey on top, an obelisk-shaped shaft of rock crystal underneath it. The idea, he explained, was to work on a contemporary, non-animalic honey, with no beeswax effects. Nouveau Né (“newborn”, but you can also hear “new nose” in French) is part of a diptych on the themes of hope and schmerz (“pain”, but it sounds much more painful in German). The latter is expressed by Abîme, authored by Laudamiel’s partner Christoph Hornetz. Nouveau Né’s punked-out honey seeped into my Berlin wanderings, making the memories stick. Thrust itself into the very structure of Berlin – its history, a shard embedded in its walls and streets, like that crystal-ozone needle rammed into Nouveau Né’s honey. On a Friday night at the (in)famous Kit Kat Club – if Süskind’s Perfume had been adapted into film by Tom of Finland, it might have been the setting for the final scene (though those dozens of sweat-slick bodies were astonishingly un-whiffy: the Berlin gay milieu clearly bolsters the deodorant industry). In the grey dawn light, wandering out of the Kit Kat into a convenience store for a 6 a.m. snack and a last dance with the handsome bearded Asian cashier. Then down Heinrich-Heine Strasse with its graffiti, dumps, bullet-pocked squats and foreboding power stations: a dystopian postcard-perfect image of the former East Berlin. In the lovely Jugendstil courtyards of Hackesche Höfe, now dotted with clubs, restaurants, theatres and quirky shops: once, a plaque reminds us, a hub for the Jewish community. At the foot of a gigantic 70s apartment block straight out of Andreas Gursky, satellite dishes blossoming on every balcony to catch Turkish TV, encasing the massive concrete bunker built in 1943 by Soviet forced labor. It proved too costly to demolish: the Pallasseum, aka Sozialpalast, was built around it. But also: the deep Slavic despair of the burly handyman at the lovely Quentin Design Hotel (that’s my room on the website), when he realized he would have to break open my defective room safe to liberate my wallet. He looked as though he’d cry. I felt like hugging him. Scenes now caught in the amber of memory. A lick of honey for the Berlin bear. To read part 1 and 2, click here and here. 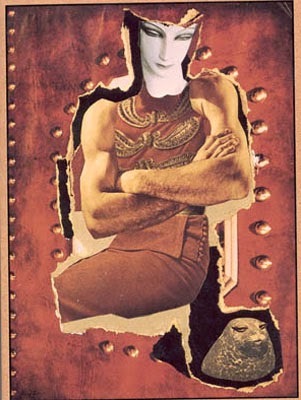 Illustration: The Tamer, by Hannah Höch (1930). Hey Katie! Don't know whether Nouveau Né might be your Goldilocks honey, but it definitely shies away from pissy to my nose. Of course *I* shied away from the co-ed loo at the Kit Kat (and in order to do so drank as little as humanly possible), in order to avoid adding that little whiff of je-ne-sais-quoi to the blend... Pity though, if there *had* been a ladies room, it would have been the first time ever in a club I didn't have to queue to get in. As for the fragrance, I'm not sure when it'll be available but it's definitely a launch since it was presence in Milan.